Tropical Storm Guillermo may be weakening, but it’s still strong enough to force closures in some recreation areas on the Big Island and Maui. All the Hawaiian Islands are under a Flash Flood Watch (a flash flood is possible in the area because conditions are more favorable than usual for its occurrence), and all islands are on alert for heavy rainfall and high surf Wednesday (8/5) through Thursday (8/6). Hawaii Volcanoes National Park: All backcountry areas of the park as well as the Mauna Loa Road from Kipukapuaulu to Mauna Loa Lookout and the Namakanipaio Campgrounds and A-frame cabins closed Tuesday, Aug. 4 and will remain closed until it is deemed safe to reopen. The visitor centers, restrooms, lava tube, front-country trails, steam vents, and other popular features will remain open. Haleakala National Park: The backcountry areas of the park closed at noon Wednesday, Aug. 5 and will reopen for hiking, camping and cabin use once the park deems it is safe to do so. For travel safety tips, visitors are encouraged to visit the HTA’s Travel Smart Hawaii website and download the Travel Safety Brochure, which is available in English, Japanese, Korean and Chinese. Although Tropical Storm Guillermo has weakened, it still packs enough punch to bring high winds, large surf, and much rain to Hawaii. 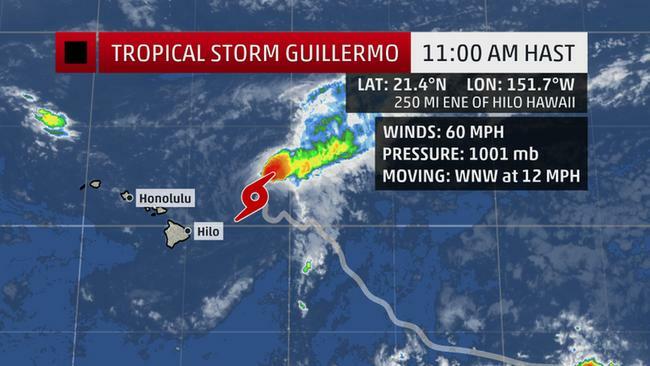 Tropical Storm Guillermo was located about 250 miles east-northeast of Hilo, Hawaii, as of late Wednesday morning. The tropical storm watch that was in effect for Hawaii has been discontinued. Guillermo is weakening, thanks to increasing wind shear and dry air aloft. Guillermo’s center will pass well to the north of Hawaii through Friday while eventually weakening to a tropical depression. Some peripheral impacts such as locally heavy rain, high surf and some tropical storm-force gusts are possible in Hawaii. High Surf: The National Weather Service has issued a high surf warning for the east facing shores of Hawaii through Thursday morning. High surf, strong breaking waves, and rip currents are expected. Rain/Wind: Enhanced rainfall chances, including locally heavy amounts in some mauka locations and some tropical storm-force gusts are possible through Thursday. A flash flood watch has also been issued for the Hawaiian Islands as rainfall totals of 1 to 3 inches are possible with isolated amounts up to 7 inches in the higher terrain. Rock and mudslides are also possible with the heavy rainfall. Tropical Storm Guillermo is expected to continue weakening through Thursday, but he’s expected to dump large amounts of rain, bring gusty winds, and usher in high surf on its way east. So, remember to stay safe, stay informed, and stay alert for possible changes.